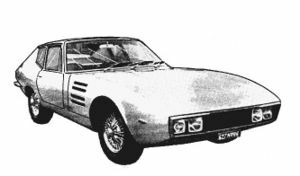 Drogo Carrozzeria Sports Cars was a niche carrozzeria in Modena, Italy, active in the 1960s. The company was founded by one-time Formula One driver, Piero Drogo, and it quickly began taking on small sports car and racing body orders from the manufacturers in that city. His bodies were used by Scuderia Serenissima and Bizzarrini, and his occasional work for Ferrari brought him some fame. Drogo and his Carrozzeria disappeared by the end of the decade.